Just completed a late summer holiday with Glenloy Wildlife. The temperatures were much more suggestive of autumn than winter, and the radiators have definitely been in action in the Lodge. Nevertheless, we managed to stay dry most days and had a great week for sightings. The heather is in full bloom and the hills are glowing purple. With normal August rainfall resumed, the vegetation is looking very lush, in contrast to the parched fields we saw down south. Purple devil’s-bit scabious, red fireweed and yellow ragwort added significant splashes of colour to a green landscape. Our most memorable day was spent with the Sheerwater, visiting Muck. Loads of common seals on the skerries, despite flotillas of kayaks. This suggests that they may be getting more tolerant. We had a peregrine fly over as we were still in the Arisaig channel. On the trip over to Eigg, skipper Ronnie spotted a total of eight minke whales, and provided great views of several of these for passengers. We also saw a few porpoises before joining a pod of 30-40 common dolphin, including calves. Just before reaching Eigg the large fin of a basking shark hove into view. This pretty much completed the cetacean set before lunchtime. Other sightings were not quite as dramatic but included a pair of sea eagles over Eigg as we were waiting to depart in the afternoon. Grey seals joined the harbour seals on the rocks outside of Muck, and we had good views of great skuas, auks, gannets and shearwaters. As usual we picked the calmest day of the week in which to sail, and this was rewarded in spades! We had a pretty good week for raptors in general. Watching a pair of golden eagles over Corrie Dubh in Glen Loy, we saw them land on a craig, only to flush out a ptarmigan from underneath. A lucky escape! 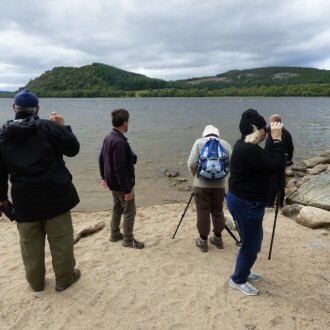 We travelled to Loch Ruthven when the weather was poor in Lochaber and saw a pair of ospreys fishing in the loch (windy as ever). Other sightings that day included two kites, one (possibly two) hen harriers, kestrel, sparrowhawk and lots of buzzards. A trip to Lochaline produced both golden and sea eagles over the ridge at the far side of the loch. Our Friday trip to Moidart was also rewarded with a goldie over Laudale and a perched sea eagle at Castle Tioram. As we also saw otters on both of these trips this turned both days into ‘Big 5’ days, meaning we had two in the week. The big dog otter with a wonky tail has been showing well this last few weeks, and we hope it continues to fish in the Shiel for the rest of the season, at least. Signs of autumn are inevitable. 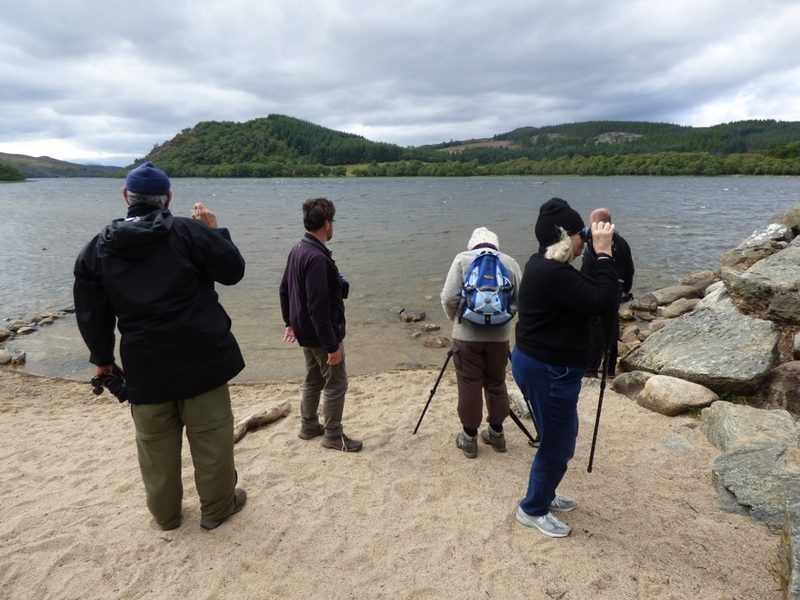 We were lucky enough to see several Slavonian grebes at Loch Ruthven, including a parent with three well-grown chicks. Some of the other birds were starting to go into transition, however, less than a week later I spotted two in Loch Linnhe in their usual wintering station. Similarly, many of the black guillemot have changed to winter plumage, and the nest boxes at Ardgour have finally been abandoned for the winter. As compensation we have seen porpoise while waiting for the Corran Ferry on a couple of recent visits. Divers are also starting to appear more regularly on Loch Linnhe, with a group of three red-throats yesterday. Black-throats can still be found, but not in all their usual locations, as they start to move out to the coast. Meadow pipits are flocking and starting to leave the glens. Young wheatears were visible along the coast. Sand martins have also abandoned their holes and the swallows and martins are gathering on overhead wires. 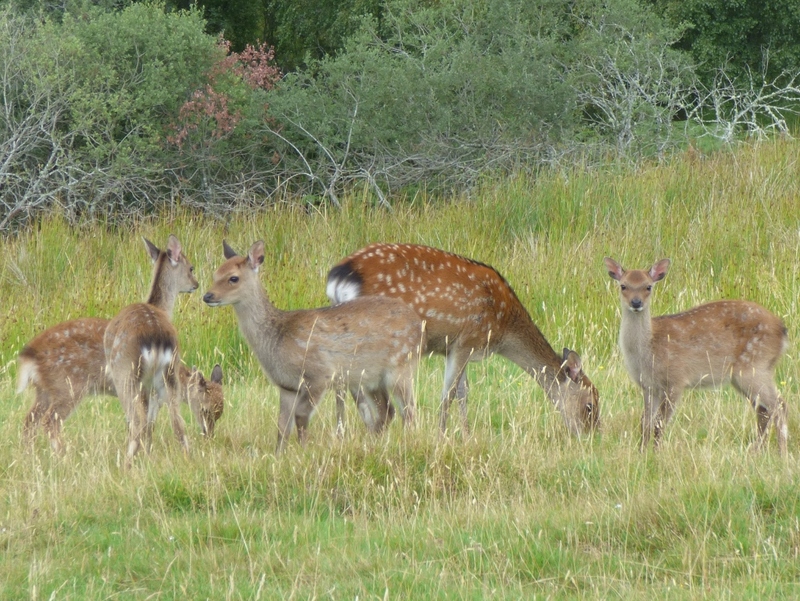 The red deer have shed the velvet from their antlers, and calves have largely lost their spots. 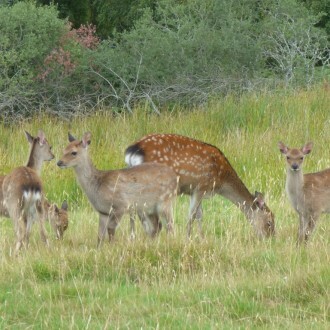 The sika are still sporting their spotty coats, however, and have been showing well on the south side of Loch Ness. At Glenloy Lodge the squirrels are visiting the garden much less frequently and are presumably foraging more for natural food. I was therefore surprised to see four red squirrels at the feeding station at Inchree yesterday, despite little food in the feeders. The mother pine marten and her brutish son (no manners!) have been visiting the feeders increasingly early and were later joined by one of the older males last night. Bats flit around the yard at a more sociable hour. Family flocks of crossbill and bullfinch are flying around the local woods. We made the necessary trip down south to greet our beautiful new grand-daughter, named for the eagle with the sun in its eyes. We managed to have a quick excursion one sunnyish afternoon to a local chalk down and were rewarded with brilliant Adonis blues, chalkhill blues and brown argus, flitting amongst the withered vegetation. Although our speckled woods, scotch argus and green-veined white continue to fly locally, this made a very welcome change and provided a splash of colour. Spaces are still available on the red deer rut break and we would welcome any enquiries.